Physicists are hunting for an elusive particle that swings both ways, and if they find it, it could explain several bizarre results found at atom smashers around the world. In modern physics, matter is divided at its most basic level into two types of particle: On the one hand are quarks, which most often bind together to form protons and neutrons, which in turn make up the nuclei of atoms. On the other hand are leptons. These include everything else with mass — from common electrons to the more exotic muons and taus, to faint, nearly undetectable neutrinos. Under normal circumstances, these particles mainly stick to their own kind; quarks primarily interact with other quarks, and leptons with other leptons. "Leptoquarks have become one of the most tantalizing ideas for extending our calculations, as they make it possible to explain several observed anomalies," Roman Kogler, a physicist at the LHC, said in a statement. Just what are those anomalies? Past experiments at the LHC, Fermilab, and elsewhere have turned up strange results, with more "events" where particles were created than the dominant physics theories predicted. Leptoquarks, which would break down into showers of other particles soon after their creation, might explain those extra events. To hunt the leptoquark, researchers at the LHC sift through huge volumes of data. The LHC smashes together protons at extremely high energies, and the hope isthat over time patterns will emerge in the data from those collisions that would show that leptoquarks occasionally, briefly appear in that creative blaze. So far, newly released papers have only ruled out certain kinds of leptoquarks, showing that leptoquarks that would bind leptons to quarks at particular energy levels — haven't yet emerged. But there are still wide ranges of energy to explore. Yiming Zhong, a physicist at Boston University and co-lead author of an October 2017 theoretical paper published in The Journal of High Energy Physics titled The Leptoquark Hunter's Guide, said that while it's exciting to see LHC researchers hunting leptoquarks, he thinks their vision of the multicoupling particle is too narrow. Particle physicists divide matter particles not just into leptons and quarks but also into categories they call "generations." The up and down quarks, as well as the electron and electron neutrino, are "first-generation" quarks and leptons. The second generation includes charm and strange quarks, as well as muons and muon neutrinos. And top quarks, bottom quarks, taus and tau neutrinos make up the third generation, according to CERN, the European Organization for Nuclear Research, which operates the LHC. First-generation particles are lighter and more stable, whereas the second and third generations are more massive and shorter-lived. The leptoquark searches published by the LHC all assume that the leptoquarks follow generational rules that govern the known particles. A third-generation leptoquark might couple with a tau and a bottom quark. A second-generation one might couple with a muon and a strange quark. And so on. But Zhong told Live Science that any complete leptoquark hunt has to assume "multigeneration leptoquarks" could be out there, swinging wildly perhaps from first-generation electrons to third-generation bottom quarks. 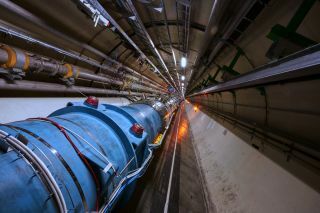 He said he'd heard rumors that researchers out there are ready to begin such a search, but that none of the papers yet released from the LHC reflect that openness to possibility. In the meantime, leptoquarks might be out there, coupling briefly with whatever particles they choose before disappearing in a flash. Or they might not. For now, the leptoquark hunt is still on.